Amazingly Fragrant Roses. The James Alexander Gamble Fragrance Award Winners. Fragrant Roses Are The Icing On The Cake. Lose Yourself In The Fragrance. The very best Fragrant Roses, just like the very best ﻿Disease Resistant Roses,﻿ are the Award Winners. These highly fragrant roses have won awards not just for Fragrance, but also for other qualities such as disease resistance, shape, colour, size, length of flowering period and hardiness. All of the Fragrant Roses on this page are the winners of the John Gamble Fragrance Award from 1961 to 2013. They are listed in order of the date of the Award. This Award is not given every year; it is only when an especially Fragrant Rose comes along and meets all of the stringent requirements that the Award is given to the rose breeder. So if you are searching for that special rose with amazing perfume for your garden, you can't go wrong with one of these beauties. The Award is given by the American Rose Society and is also known as the 'ARS James Alexander Gamble Rose Fragrance Award'. If you are looking for the most highly fragrant roses for your garden, be sure to check the information provided by your local or online nursery. Descriptions of roses - and plants in general - vary quite substantially. One seller may say the rose has high disease resistance whereas another may say 'prone to mildew and black spot'. One may say it flowers from spring to summer, whereas another may say it flowers from spring to autumn. You can find these facts out online by visiting as many sites as possible, but you can guarantee that all of the roses on this page are among the most fragrant roses available today. Always do a bit of research first; one rose may do well in one climate zone, but may not perform as well in another. 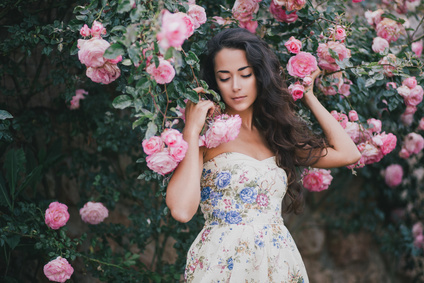 If you would like to find out just what the various perfumes of roses smell like, this website will tell you a lot about them: Rose Fragrance. Crimson Glory. Hybrid Tea. 1961. A dark red velvety rose with a strong Damask perfume. It is available as a shrub rose to 4 feet and also as a climber to over 6 feet. It flowers from spring to autumn and is hardy and vigorous; it is a repeat bloomer. The blossoms are double, and are up to 5 inches across. A lovely big rose. It is an excellent cut flower with long single stems. It likes full sun. Bred by Kordes in 1935, this highly fragrant rose has certainly been around for a while. Available as a Climber to 6 feet. A mid-pink rose with gold at the base. 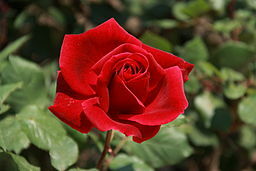 It has the classic Hybrid Tea Rose shape, with pointy petals and straight sides. It is an excellent cut flower, having sparse foliage at the base of the plant which encourages good air circulation, and long upright stems. As with most Hybrid Tea Roses, the more you cut the blooms for the house, the more you get on the bush. The perfume is strong and fruity and it is a repeat bloomer. It is disease resistant and hardy and likes full sun. The blooms are double, up to 5 inches across, and it will grow from 4 to 6 feet high. The flowering season is from mid-spring to summer. It was bred by Lindquist in 1954. The blooms just keep coming on this super fragrant rose. There is a climbing form, but it is hard to find ... to about 6 feet. Chrysler Imperial. Hybrid Tea. 1965. This highly popular fragrant rose has dark red velvety blooms with a very strong Damask fragrance. Its bloom period is from late spring to autumn, and it blooms repeatedly. The blossoms are up to 5 inches across with up to 45 petals. It grows as a shrub rose to 4 feet and as a climber to 6 feet or more. It is an excellent cut flower with the classic pointy petals of the hybrid tea roses. It has mid-green to dark green semi-glossy leaves which show off the red blooms nicely. It is hardy and likes full sun, but will tolerate some shade. It has good disease resistance and was bred by Lammerts in 1952. Available as a Climber to 6 feet. Sutter's Gold. Small Hybrid Tea. 1966. This beautiful intensely fragrant rose is ideal for a small space. It is a yellow rose flushed with orange to red, with a very strong, sweet fruity fragrance. It grows to a height of 3 feet or more and makes an excellent small hedge. The darkish green foliage really shows off the golden orange colour. The blooms are double, to 5 inches across and are produced continuously during the long flowering period. It was bred by Herbert Swim in 1950. Granada (Donatella). Hybrid Tea. 1968. Granada is a stunner, comparable with the Joseph's Coat Rose. The perfume is an intense mix of Damask and Spice. The blooms are from 4 to 5 inches across, with 25 to 30 petals. It is available as a shrub rose from 2 to 4 feet in height and as a climber to 6 feet (divine). The foliage is dark green and it has excellent stems for cutting: the lightly ruffled blossoms are long-lasting in a vase. It will bloom continuously from early spring right through to autumn. An absolute must have fragrant rose for me. Bred by Linquist in 1963. Fragrant Cloud. Hybrid Tea. 1970. This highly fragrant rose is in the Modern Rose Hall of Fame. 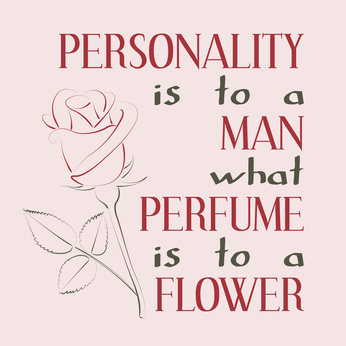 It's perfume is a mix of Fruity (Citrus), Spice and Damask, making it one of the most popular roses ever. It grows as a shrub to 3 feet and a climber to 5 feet or more. The double blooms are an orange to pale crimson red from 5 inches to 7 inches across, with 25 to 35 petals, and the foliage is mid to dark green. This rose is highly﻿ disease resistant ﻿and blooms in late spring and summer. It makes an excellent cut flower. You can definitely bring this one inside for an intense experience. Bred by Tantau in 1963. Climber to 6 feet. Papa Meilland. Hybrid Tea. 1974. One of the most famous of the dark red velvety fragrant roses ever, this beauty has the real old-fashioned rose fragrance. With its dark green foliage and the classic Hybrid Tea shape, this is definitely the rose for Romance. Perfect for Valentine's Day. If you want a dozen long-stemmed red roses, this is the one! It flowers from mid-spring to late autumn. Inducted into the Rose Hall of Fame in 1988. Vigorous and reliable 4" to 5" blooms on a 3 to 4 foot bush. It was bred by Alain Meilland in 1963. A stunning glowing yellow Floribunda rose with high fragrance. It is a small shrub from 2 to 3 feet in height and its perfume is a sweet Licorice. It will repeat bloom from late spring right through to autumn with double fluffy petals from 3 to 4 inches across which do not fade with age. One of the most popular of all the yellow roses. The leaves are a glossy mid to darkish green. It is hardy and has excellent disease resistance. It is considered to be among the world's top ten roses and will make a perfect hedge, without too many thorns. It was bred by Kordes in 1973. Double Delight. Hybrid Tea. 1986. This is one of the most popular roses of today. And no wonder: one of its parents is 'Granada' (see above) and the other is 'Garden Party'. I was given this rose and I can honestly say it's stunning. The colours vary widely depending on the soil and the climate and the fragrance is intense - a fruity citrus and spice. Just look at the Google Images of this divine creation: Double Delight. The petals are 5 inches across - at least - and the petal count is 30 or more. The foliage is mid-green and this amazing rose will flower from mid-spring right through to autumn. No need to say that 'it makes an excellent cut flower for the house'. See it on its own page: the Double Delight Rose. Inducted into the Rose Hall of Fame in 1985. It was bred by Swim and Ellis in 1976. Climber to 6 feet. Fragrant Hour. Hybrid Tea. 1997. ﻿Information and Pictures from All Things Plants. A beautiful, highly perfumed, lavender Floribunda Rose. The fragrance is intense: a fruity citrus. It blooms continuously from late spring right through to autumn, with 4 inch blossoms which are delightfully ruffled and edged with red. The petals number from 25 to 30; it makes an excellent, long-lasting cut flower in a vase. It is a shrub form from 3 to 4 feet in height with dark green foliage. It was bred by Swim and Weeks in 1968. Climber from 10 to 12 feet. See the climber on Google Images. A stunningly beautiful pink rose. This highly fragrant rose is a Hybrid Tea which is cream flushed with pink with a hint of gold on each petal. Each bloom is 5" to 7" across. Huge! It has 30 to 40 petals. The intense perfume is sweet and spicy. This beauty was an AARS winner in 1994, and no wonder. The foliage is mid green. It will grow vigorously to a height of 4 feet as a shrub, and to 6 feet as a small climber. With a width of 2 to 3 feet, it won't take up much room. It has very good disease resistance and blooms from summer through to autumn with continuous flushes. This beautifully formed fragrant rose, looking as if it were hand painted, is definitely high on my list. Bred by Tracy in 1992. Small Climber to 5 feet. Mr. Lincoln. Hybrid Tea. 2003. 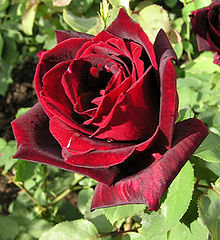 This deep red, velvety, highly fragrant Hybrid Tea Rose is one of the most popular dark red roses ever. The shrub form will grow from 3 to 4 feet, and the climber to about 7 feet with a width of 2 feet. So it won't take up too much room. The petal count is 35 to 40 and the bloom size is about 5 inches across. It will flower from mid spring through to autumn. The foliage is dark green which sets off the deep red bloom colour beautifully. Bred by Swim and Weeks in 1964, one of its parents is Chrysler Imperial (see above), so it's no wonder this rose is highly fragrant. With its characteristic long stems, this is an excellent cut flower which will fill your home with intense old-fashioned rose fragrance. Climber to 7 feet. Sheila's Perfume is a delightful highly fragrant Floribunda Rose (but its petals are reminiscent of a Hybrid Tea). Being a Floribunda there are so many more blooms, in clusters, on this rose. It grows from 4 to 7 feet in height and 3 feet in width. It makes an excellent hedge: Imagine a perfumed hedge like this! The fragrance is fruity and Damask combined, making it both old-fashioned and modern at the same time. The colours are pink and cream, edged with a cherry colouring and flushed with gold. Beautiful. The foliage is mid-green. The blooms are 4" to 5" across with 20 to 25 petals. This rose was bred by Sheridan in 1982 and it will flower from late spring through summer. Fragrant Plum. Hybrid Tea. 2007. This beautiful Hybrid Tea rose has an intense sweet, fruity fragrance which has been described as 'plum-like'. 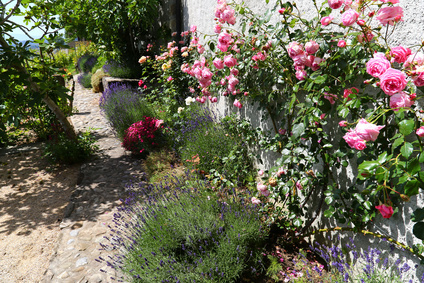 (I have read that the lavender, mauve, bluish, lilac roses have the most intense perfume). The petals are lavender/mauve with deep smoky purple at the raggedy edges. There are 25 to 30 petals and the blooms are 5 inches across. This rose was bred by Christensen in 1990. It will grow to 4 feet as a shrub and 6 to 7 feet as a climber. It has vigorous, upright, long stems with mid-green foliage and is exceptional as a cut flower for the house, filling it with its intense perfume. Its flowering period is from mid-spring through to autumn. Sweet Chariot. Miniature Patio Rose. 2008. Information and Pictures from All Things Plants. Louise Estes. Hybrid Tea. 2010. An out of this world Hybrid Tea Rose. You will want this superior fragrant rose! It was named for the 'Elle' Magazine (not, as I thought, for Elle Macpherson). 'Elle' means 'she' in French. A Romantic name for a truly romantic rose. The fragrance is a fruity citrus with a hint of spice. The colours are of soft pink to peach and apricot with gold at its heart. It will flower for a long period: from early spring right through to autumn. 'She' has up to 50 petals, blooms are 5 inches across with mid to dark green foliage. A beautiful rose; just looking at it is enough, but then add the divine, intense fragrance and you'll be bringing it inside - often. (The long single stems, characteristic of the Hybrid Tea Roses, make it excellent for a vase). It will grow up to 5 feet in height and will flower from late spring until late autumn. Excellent disease resistance. Her history is a bit mixed: Bred by Jacques Mouchotte in France before 1999 and introduced by Jackson and Perkins in the US in 2005. Falling in Love. Hybrid Tea. 2012. Wild Blue Yonder. Grandiflora. 2013. Another rose with a citrus and old-fashioned rose fragrance combined. This stunning rose with delightfully ruffled petals, is actually a Grandiflora Rose (a cross between a Floribunda and a Hybrid Tea), giving the best of two favourite rose types. See another example of a Grandiflora rose: the Queen Elizabeth Rose. Wild Blue Yonder makes a great hedge, or a single specimen rose for under a window. The intense rose fragrance will overpower you when the window is open. Each bloom has 25 to 30 petals and is from 4" to 5" across. It grows from 4 to 5 feet in height and about 4 feet in width. It blooms from late spring through to autumn with excellent disease resistance. The colours are a deepish lavender/purple/red with a pale center. The foliage is mid-green and sets off the ruffled mauve blossoms perfectly. Take a look at lots of Google Images of this winning rose. There are just so many variations on this colour theme; it is even said to resemble a Camellia flower. It was bred by Tom Carruth in 2006. Find Lots More Of The Most Fragrant Roses On My Pinterest Board. Home. Return to Types of Roses. "If you enjoy the fragrance of a rose, you must accept the thorns which it bears"